The Bio-Rad TC10 automated cell counter provides you with accurate, rapid counting in a compact, standalone instrument. This cell-counter fits nearly anywhere, and is intuitive to operate, simply load the slide, insert into the reader, and view your results within 30 seconds using the built-in auto-focus. 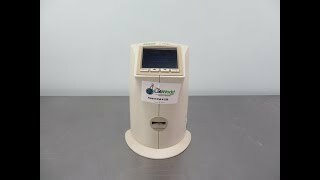 This automated cell counter can be used either to determine a total cell count without the subjectivity of manual counting, or with the addition of trypan blue, you can also asses the viability of your sample cells. Up to 100 results can be stored in on board memory or exported through a USB key or a thermal printer. Results can be determined from as little as 10 µI of suspended cells, allowing you to retain more of your critical cells. The cell counting accuracy of the TC10 counter is comparable to results obtained with a hemocytometer when counting cells within the ranges of 5 x 104-1 x 107 cells/ml and 6-50 µm in diameter. Using an automated cell counter helps eliminate second guessing, improve chances of reproducible results downstream, saving you time and money. This Bio-Rad TC10 automated cell counter has been fully inspected and is performing to expectations. All of our lab equipment comes backed with our standard warranty. Should you have any questions, please don't hesitate to contact us.